A surprising new take on the concept of a tattoo parlor, this studio is run by a friendly couple who in a way specialize in putting customers – especially first timers – at ease before giving them the most amazing tattoos at the most unbelievable prices. The entire range and typology of tattoos are available, from basic outlines to color imprints of photographs on the skin.Thanks to the clean and hygienic setup, and the precision and relaxed confidence with which the artists work, the process of getting a tattoo or a piercing – usually associated with pain and apprehension – is turned into an exciting and even fun experience. 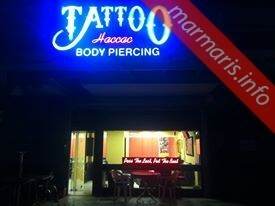 Ever thought of visiting a Haccac Tattoo Marmaris for coffee? 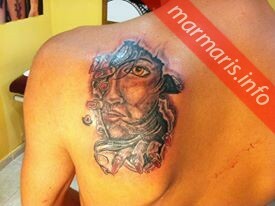 Well, insane though it may sound, Haccac Tatto Marmaris is one place where it is possible for you to do just that. While an expert works on a tattoo that is nothing less than a work of art, you can expect to be offered tea or coffee (which tastes quite good actually). Often a tattoo can take 6 hours at a stretch, but time flies as you are entertained with stories of travel and Marmaris in general. All this for a sum of money that would not have bought you the most basic of tattoos in the UK. This is one place that everyone planning a trip to Marmaris, or anywhere nearby, should sample.